The latest volume of Ruth Schmuff’s Stitches series came out early this month and it’s a real winner. Available in both full (8.5 x 11) and travel (8.5 x 5.5) sizes, the book has almost 300 stitches, classified by type. The individual chapters cover diagonal straight, crossed and tied, as well as eye stitches. There are also chapters for darning patterns, blackwork, and decorative stitches. As in the other books in this series, each page has a large clear diagram of the stitch. These diagrams are not numbered and there is no explanatory text. 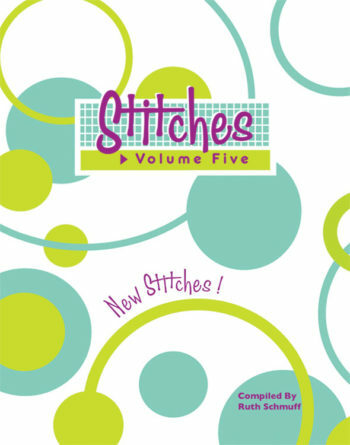 The page has the stitch’s name, but beware, often the author does not use standard names for her stitches. Many of her stitches have names such as “4-way Continental Variation 4,” making it difficult for stitchers to find specific stitches when using the index instead of browsing. This can make for confusion for stitchers. In the back there is an alphabetic list of stitches. Stitches that are compound, i.e. containing elements of more than one type of stitch, will appear more than once. One of the aspects I liked best about this book is that there were many lovely stitches that only contained Tent and Reverse Tent. These will provide some different looks for those folks who don’t know lots of stitches. I also liked that there were fewer open stitches in the earlier (stitches) chapters of the book. In the previous volume, the number of open stitches often made it difficult for me to find stitches that would work. While I’m all for open stitches in many cases, they assume that you are stitching on a colored canvas. The reality is that, especially for backgrounds, we are often using colored threads on white canvas, so open stitches will not work. I also liked that significant attention was paid to laid fillings, darning patterns, and Blackwork. Too few needlepoint stitch dictionaries pay attention to these valuable techniques. As is the case with all the volumes in this series, Schmuff’s non-text approach leaves out valuable information. In the decorative stitching section (a difficult area for many of us) these problems stick out. Some of the stitches have numbers only, so I have no idea of what the stitch looks like. Another, for in-line couching, has just an illustration that looks like a ribbon being sewn on with Running Stitch. These kind of stitches cry out for explanation, but throughout the book, readers could benefit from the author’s experience as a shop owner, teacher, and stitch guide writer to give help through some text. The book could also be improved by the simple addition of pages noting the beginning of each chapter. Although each chapter has stitches arranged alphabetically, I usually can only tell that a new chapter has begun after a few pages when I start wondering why the stitches are suddenly a different type. I like the travel size because these books, which are over 300 pages, are very heavy in the larger size. Even small they stay firmly at home. I get the apps, once available, for travel. But the big problem with the small size is that the pages are just reduced from the full-size. Although the generous diagrams are still readable, the footer and index have type that is small enough to be uncomfortable to read. All these flaws are ones that can be fixed and they are ones that would make the book significantly more useful for the stitcher. What’s the problem with doing that? Note: The book is available through most needlepoint shops and from Ruth’s shop, Bedecked and Beadazzled.